While shopping for cool and unusual beauty products in Berlin, Germany, I stumbled upon an amazing new product I had never seen before: the ever-so-chic Sen7 Fragrance Atomizers ($39, Sen7.com). I had been searching forever for a cool atomizer for my favorite perfumes because I travel so much, but I have never found anything as amazing as these. Usually most atomizers are unattractive and boring. They break or are hard to fill up. The Sen7 Collection is a unique and elegantly designed atomizer that fills up with ease because of its funnel system. Coming in a myriad of colors, they look fabulous when you pull them out and spritz on your favorite scent. You have so many shimmery colors to choose from, such as metallic neutrals in gold, silver, gun metal, bronze, black and white or brights such as red, pink yellow, green, light and dark blue. 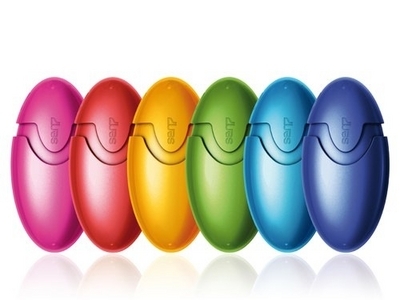 They also have rubber ones for a soft-touch experience and leather pouches to keep your Sen7 safe from scratches. With all these choices, there is the perfect atomizer for you. Each one has a tank volume of 5.8 ml, which is roughly about 70 sprays, making it ideal for vacation or in your purse when you are on-the-go. Buy a few and color code your fragrances if you like to switch up scents depending on your mood. Now it’s fun to smell yummy!